A core text for undergraduate courses in American Public Policy, or supplemental reading in such courses as Introduction to American Government or Politics, American Public Policy Analysis, Introduction to Political Science. A substantive alternative to typical issues texts which cover too many issues, too superficially this intriguing and comprehensive text offers a more in-depth and coherent approach to contemporary policy problems and solutions. It provides a conceptual framework in which students can become comfortable actually doing policy analysis, and in learning skills beyond reading about certain political issues. 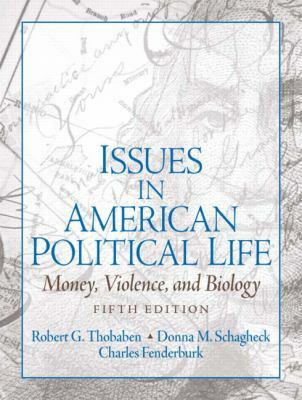 Thematically organized, it looks at nine specific issues grouped into three broad categories that hold an enduring importance in American political life money and politics, violence and politics, and biology and politics. All nine chapters and their respective topics (campaigns, corruption, welfare, crime, terrorism, arms control, the environment, biomedical issues, and biotechnology) have a strong conceptual base with current political dimensions and policy concerns woven throughout. Students not only learn the context, status, and prospects of issues confronting the U.S. government, but also see how these issues now cross our domestic borders into a global realm.Charles Funderburk is the author of 'Issues in American Political Life: Money, Violence and Biology (5th Edition)', published 2005 under ISBN 9780131930629 and ISBN 0131930621. Loading marketplace prices 106 copies from $0.30 How does the rental process work?